This 43-year-old athlete is not just being praised for successfully completing a marathon – she is also being praised for what she had in her hands when she crossed the finish line. 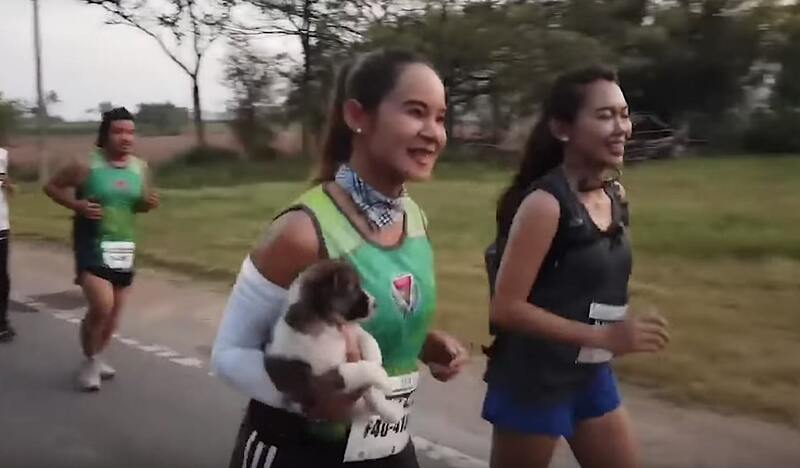 Khemjira Klongsanun was only seven miles into a marathon in Ratchaburi, western Thailand when she noticed that the other participants were running around an anxious little puppy on the side of the road. Because the puppy seemed to be just a few months old, Klongsanun could not bear to leave him on the pavement. “It seemed to me that this little guy was lost. There were no houses, no other dogs, or no people around. So, I picked up the puppy, if only to take him out of the unsafe environment,” said Klongsanun, as reported by The Daily Mail. Sure enough, Klongsanun scooped up the little pup and carried him for the remaining 19 miles of the marathon. In the aftermath of the marathon, she did her best to try and find the dog’s owner. She even took it home with her and searched for its family, but to no avail. Klongsanun finally decided to keep the pup for herself and name him Chombueng after the marathon. Now that he has been vaccinated and neutered, he is reportedly living a cheerful life alongside Klongsanun’s two other dogs.